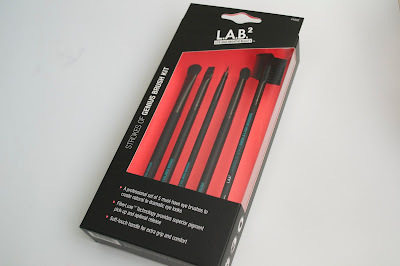 Today I have a review of this makeup brush kit from LAB2. This is the Strokes of Genius Brush kit which comes with 5 eye brushes that are everything you need to create great eye looks with ease. LAB2 has some good quality brushes at an affordable price. Find out more info and my thoughts on these brushes below! Offering you the latest technological advances in beauty, starting with FiberLuxe technology; cutting edge synthetic fibers specially designed with the softest and highest quality filaments; providing you with superior pigment pick up and release, even color distribution, precise makeup application, and flawless professional results. All brushes are cruelty free, vegan, and hypoallergenic. Eyeshadow Brush - Distributes color evenly onto the lids, crease and brow bone. The eyeshadow brush did pick up shadows quite well and kept the color where I wanted it to go. The bristles are soft and I really like the way these feel when you use them. All of the brushes are lightweight but they don't feel super cheap or low quality. Crease Brush - Accentuates the crease and blends colors seamlessly together to soften harsh lines. This is a small brush which makes it easy to really get into the crease and pack on the shadow. This blended out shadows quite well and took care of any harsh lines. Pointed Eyeliner Brush - Delivers a precise, firm, even line. I found this to be a brush that I needed to finally try out gel liner. I have always skipped gel liner because I felt like I didn't have the right brush. This one is thin and the bristles are pointed at the end making it easier to get my eyeliner precise. Brow & Liner Brush - Fills in brows and lines eyes for extra definition. This is a great brow and liner brush. Since I use liquid liner more often, I ended up using this to fill in my brows and make them more defined. Brow & Lash Groomer - Brooms, combs, and defines brows and lashes. This is a pretty standard brow and lash groomer with a comb/brush on one end and a spoolie on the other, and I'm happy that this is included in the set. Overall, I think the LAB2 Strokes of Genius Brush Kit is great for those that want eye brushes with a good price tag and still know they are going to be great quality. I love that they have a nice feel to them on the handles and the bristles are soft enough where blending is easy. LAB2 Stroke of Genius Brush Kit retails for $20 and can be found at Walmart stores and on the Amazon website. The Target Beauty Boxes Are Back!